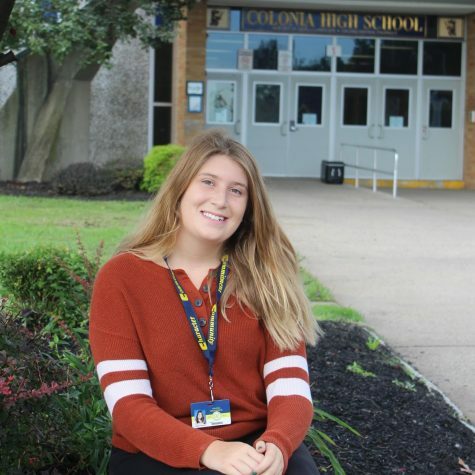 Megan Anderson is an 16 year old junior at Colonia High School. Anderson swims for her high school team (CHS), for her club team (Devilfish) and for her summer team (PCC). Also, she is an homeroom representative for her homeroom. Furthermore, Anderson has a younger brother, Billy, who is in in ninth grade. Anderson also has two pets that her family rescued: one is a ten year old cat name Bullseye that she has had since she was six years old and the other is a dog name Willie who is five years old that her family rescued two years ago. During her free time, she volunteers as a Special Olympic coach for swimming. Next, during her free time, she listens to music to relax. Her favorite genre of music is pop, country, R&B or rap. Lastly, she loves to watch reality TV and Netflix shows. Her favorite shows include, Big Brother, The Bachelor, Grey's Anatomy, Gilmore Girls, and many more.